The Higher Education Policy Institute (HEPI) has worked with the polling company YouthSight on a survey of attitudes towards Brexit and political parties among full-time undergraduate students. The research shows students are overwhelmingly in favour of remaining in the European Union – 76% opt for remaining in the EU compared to 6% backing for Theresa May’s recently rebuffed deal, 7% for no deal and 11% undecided. When the option to remain is removed, students become less certain, with 36% of those surveyed responding ‘don’t know’ compared to 37% for Theresa May’s deal and 27% for no deal. A majority of students want the opportunity to demonstrate their views – more than two thirds (69%) of students want to do so through a second referendum but only around one-fifth (21%) think this should be done through their elected representatives voting in Parliament. This represents a slight increase since HEPI/Youthsight’s previous research in this area. 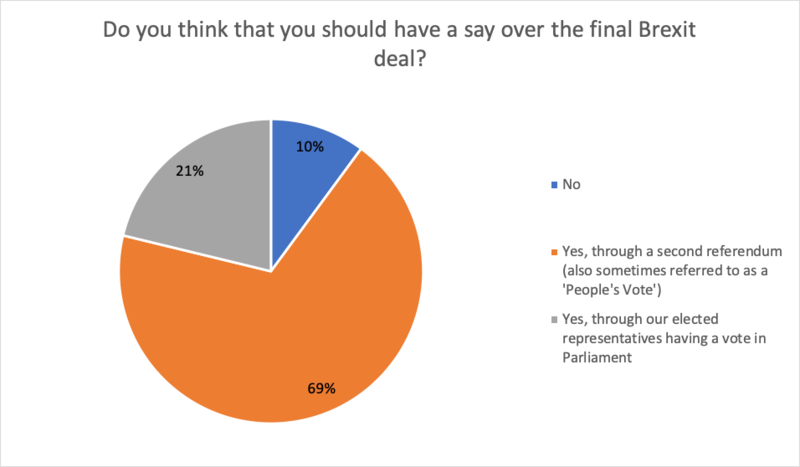 When asked in December 2017 62% of students wanted to have a say over the deal through a second referendum, and 22% wanted to do so through their elected representatives voting in Parliament. These students have largely not had the opportunity vote on Brexit as only 43% of those surveyed were eligible to vote in the June 2016 referendum, compared to 93% who would now be able. Student’s responses show they do not feel the Government is connecting with them through the process, with almost three-quarters (74%) saying the Government is doing badly at listening and engaging effectively with young people. 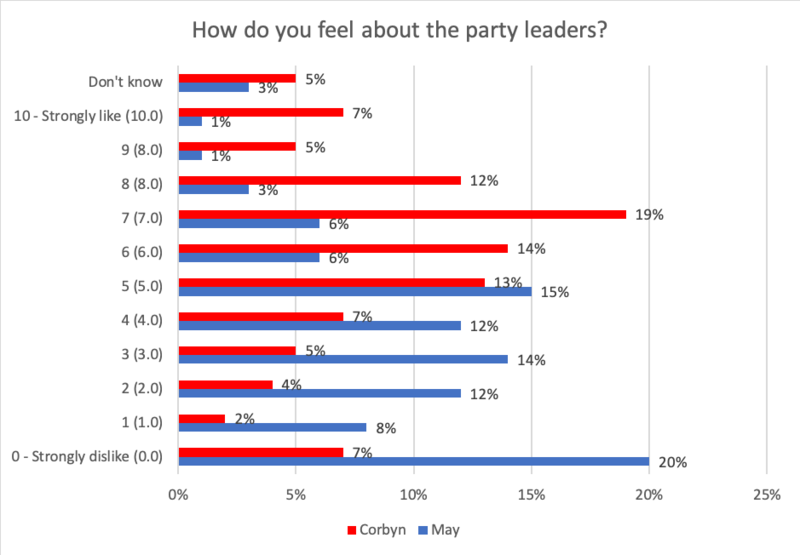 The results also show Corbyn remains popular among students, although not as strong a margin as some may expect. When surveyed, 57% of students say they like Corbyn (responding 6-10). May however, is not well liked amongst students, with 66% of students stating they dislike her (responding 0-4). However, compared to the previous HEPI/Youthsight research around a year ago, support for Labour has dropped 10%. In this time support for the Conservatives and Liberal Democrats has remained fairly steady with support for the Conservatives falling 1% and support for the Liberal Democrats rising 1%. When asked how Brexit will impact on their future voting intentions, almost half (49%) of students say they will be more likely to vote for a party which opposes Brexit, compared to 41% of those who say Brexit won’t impact their voting decision, and 10% who say they will be more likely to vote for a party which supports Brexit. However, this isn’t borne out when asking students who they are most likely to vote for. 64% of students intend to vote for a party whose current policy is to leave the European Union (Conservatives, Labour, UKIP, DUP or the Ulster Unionist Party). Parties whose current policy is to remain in the European Union (Liberal Democrats, Green Party, SNP, Plaid Cymru, Sinn Fein or SDLP) only gather 18% support. The remaining 20% stated they would vote for another party, wouldn’t vote or didn’t know. With uncertainty about where we will be beyond 29 March, and the ever-lingering potential of a second referendum or general election, this survey provides an important insight into students’ perspectives. Critically it gives the view of many who were not able to vote in the last referendum but would now be able to do so should one be called. While students generally continue to be both pro-Remain and supportive of the Labour Party, these results suggest Labour’s current position over Brexit may have cost them some support among students. This could leave Corbyn unable to guarantee the student vote to the same levels which boosted his result in the last General Election. Over three-quarters (77%) of students surveyed feel their future prospects will be worsened by the decision to leave the European Union, compared to 13% who believe they will benefit from improved prospects and 11% who said there will be no change. 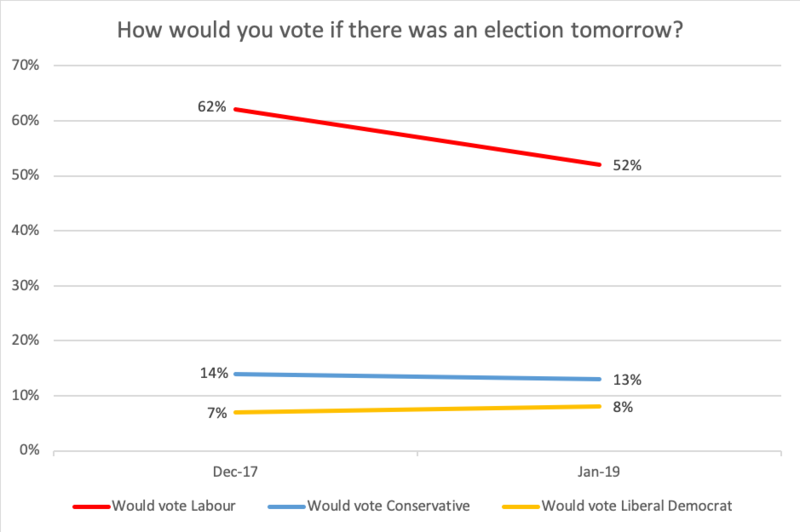 Students state they would turn out to vote in high numbers should there be a General Election, with 81% stating they would be highly likely to vote in an immediate General Election, compared to 16% who were unsure and 4% who would not vote. This supports recent trends, as it was estimated that 64% of 18-24 year olds voted in the 2017 election, the highest turnout for this age group since the 1992 election. 92% of students surveyed feel happy with the way they voted in the EU referendum, compared to 8% who would change the way they voted if there was another referendum. Leave voters are more likely to change the way they voted in a second referendum (34%) than Remain voters (2%). If students were given the choice between remaining in the EU and no deal, 80% of them would choose to remain, compared to 10% who would opt for no deal and 10% who are unsure. Over a third of students (38%) do not believe 16- and 17-year olds should be allowed to vote in referendums versus 62% who supported giving them the vote. 44% were unsure when asked how strongly they agreed with the statement ‘Opposing Brexit is more important to me than the party I actually vote for’. 32% supported this statement and around a quarter (24%) disagreed with it. Three-quarters (75%) of students surveyed believe Britain was wrong to vote to leave the EU. 14% believe we were right to vote to leave, and 12% are unsure. Wave 5 of the HEPI/YouthSight Monitor was answered by 1,048 full-time undergraduate students and undertaken between the 4th– 8thJanuary 2019. Weights have been used to ensure the sample is representative by age, gender and university type. Respondents received a £1 Bonus Bond gift voucher for answering these questions and others on a different topic. The full results, including for questions not covered in this press release, are available here. To ensure comparability with previous data, the results of which political party students would vote for were only used for those who said they had a 8-10 likelihood of voting.